For a recent afternoon tea that I hosted, one of the nibbles that I made was strawberry coconut ice. The inspiration for this was that the afternoon tea was originally going to be pink themed. In the end, I found that too hard, but I kept some of the ideas from the pink theme for the actual menu. Grease and line a 21cm square pan with baking paper, allowing the paper to overhang the sides. Put 1 cup of icing sugar and 2 cups of coconut on a large bowl. Stir in the vanilla and two third of the condensed milk. Press the mixture into the prepared pan. In another bowl, mash the strawberries until almost smooth and colour with a drop or two of red food colouring. Add the remaining 1 cup of icing sugar and remaining condensed milk, and press into the prepared tin on top of the white mixture. Place the pan into the fridge overnight, and once the coconut ice is set, cut it into 36 pieces. Enjoy! Recently, I had a hankering for my Mum's Triple Layer Orange Passionfruit Tart recently, and coincidentally had all of the ingredients in the house. This was a great excuse to whip one up. The recipe is published in the Blogger Aid Cookbook (2009) - you can buy one here. It always amazes me how the passionfruit layer sets up with just lemon juice - you start off with something really runny, but it just comes together like magic. This tart is a marvel. I recommend buying the Blogger Aid Cookbook for this and a host of fabulous recipes from bloggers around the world - and you will be doing your bit to raise funds for the World Food Program's School Meals Program. 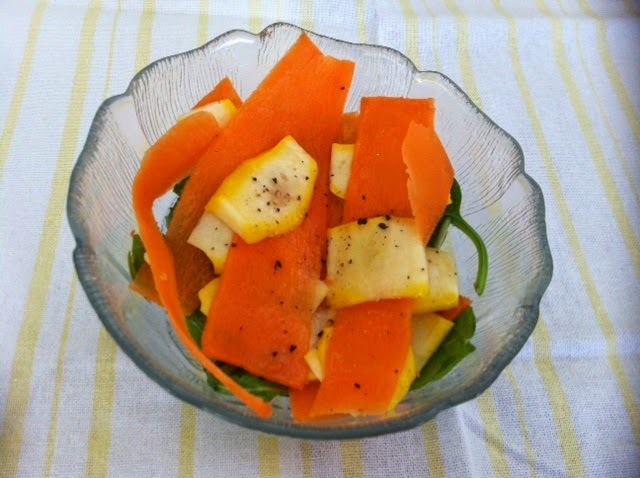 This French Friday with Dorie required us to make a very healthy salad with squash, carrot and salad greens, and an unusual vanilla flavoured dressing. The vegetables are shaved into fine strips before being dressed. I am not really a salad person, but this one was OK. I served with fish for a light lunch. There's not much else to say, I'm afraid. To see what the other Doristas thought, visit the LYL section of the website. For my recent birthday, Tim took me out to Matteo's Restaurant in Fitzroy for dinner. The menu is French-Asian fusion, making its menu quite unique from other places that I have been to. On walking into Matteo's, the entrance is decorated with gorgeous gold and red wallpaper. There is a downstairs section of the restaurant, with big plate glass windows giving views of the street, and there are intimate booths upstairs. Out the back, there is a large function area that was buzzing on the night that we were there. The large, creamy balls of fried goats cheese swam in a moat of smooth and delicious soup which was poured into the bowl at the table. I have no further information about this dish other than that it was tasty. I knew that this dish would be rich, but I didn't really understand how rich. I was glad the waiter steered me away from the Chinese doughnut with scallops and congee for entrée, as two rich dishes would not have been good. Don't get me wrong, this tasted good, but the sheer fatty goodness of the hock was a bit overpowering to someone who is used to choosing lean cuts of meat. My favourite side was the Asian greens. My favourite part of this dish was the crunchy cereal balls, which contrasted nicely with the smoothness of the panna cotta. We were both very happy with this choice, and I could have eaten another despite feeling very full by this stage. We did some celebrity spotting when Goerge Calombaris of Masterchef fame came to dine with three companions. They were seated by the big plate glass windows, so I could only see him by glancing sideways. The service at Matteo's was impeccable. Our waiter was attentive without being intrusive, and I appreciated his advice on my menu selections. It was a perfect end to a perfect evening. For Wednesday with Donna Hay this week, I chose a breakfast inspired dish - Donna's Crispy Sage Potatoes with Fried Eggs. 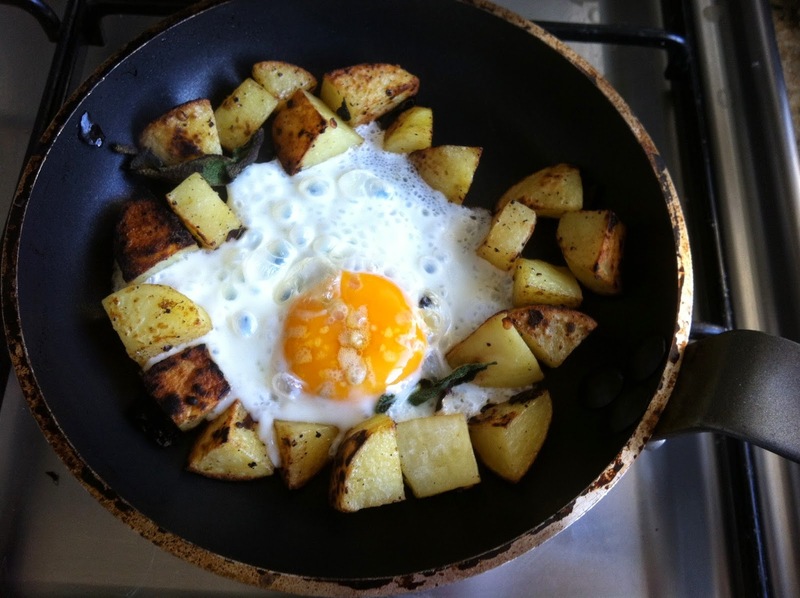 As the name suggests, it involves fried potatoes flavoured with sage, with a fried egg cracked on top. This was really quick and simple to prepare, and very tasty. What's not to like? To see what Margaret, Chaya and Sarah thought, check out their websites. I try to avoid wasting food as much as possible. I have found that most vegetables on their last leg are fabulous in a stir fry, and fruit can be included in cakes and jams. Recently, I had a forlorn piece of pumpkin in the fridge, so I made Phyllis's pumpkin muffins with it. I have no idea who Phyllis is, but she was a member of The Toowoomba Chronicle Kids Club in 1936 - before my Mum was born! 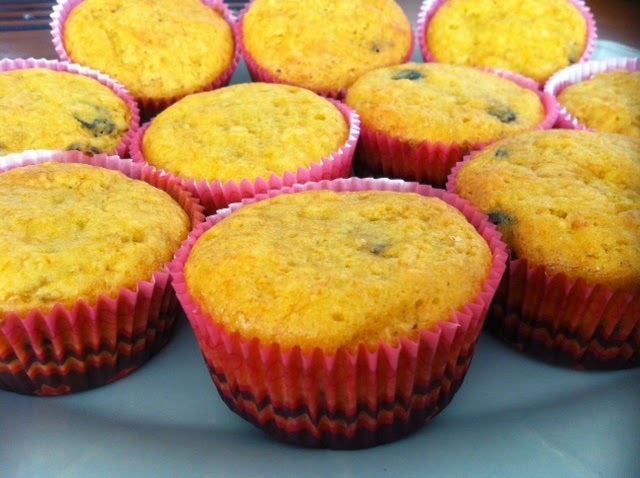 Phyllis' recipe has been republished, and is online here. So there you go - if you have a sad piece of pumpkin past its prime in the fridge, whip up some of Phyllis's pumpkin muffins for morning tea - you won't be disappointed. It was my birthday recently. As I do not live near family, if I don't make my own cake, I tend not to get one, so I always make my own. This year, I had no trouble deciding what cake I was going to make. After visiting The Beatles in Australia photographic exhibition earlier this year (of which you can read more details in this excellent post), I was fixated by a Beatles party cake in a magazine at the exhibition. The recipe, which was published in Woman's Day (visible at the bottom of Sewing the 60s exhibition post), was devised by Australia's queen of the kitchen, Margaret Fulton. I had no idea where I'd get the recipe for this cake, as the magazine in the exhibition was published in the 1960s, way before the Internet, and I had no idea how to track down the magazine. However, my idle Internet surfing was rewarded recently when I typed in "margaret fulton beatles cake". By chance, Woman's Day had turned 65 last year, and to celebrate, they had republished Margaret's recipe in an August 2013 edition of the magazine. Phoodie had published a post about this, so I did another Google search, this time for "woman's day beatles cake". I then hit the jackpot - the Margareet Fulton Beatles Cake recipe from the 1960s was on their website. You can find it here. The cake is described as a burnt sugar party cake, and is frosted with a caramel icing. 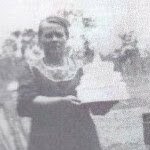 You will see from the recipe that Margaret assumed her readers would have some cake baking experience, because while the instructions are adequate for an experienced cake baker, some of the finer details required to make this cake successfully would be lost on a novice baker. Unfortunately, the link to the Beatles biscuit template does not work, so I had to design my own template, working from the photograph of the cake. I also decided to use a different caramel icing recipe, as Margaret's version uses 4 cups of brown sugar and is of the tricky fudge variety that is impossible to work with. That said, the icing that I used got tricky to work with over time, as it dries out and sets fairly quickly. With respect to the biscuits, I found that they took much longer than the 8-10 minutes quoted for baking time. Grease and line 2 x 8" round cake tins. Preheat your oven to 180 degrees Celsius. Place 1/2 cup of sugar into a heavy saucepan and stir over low heat. 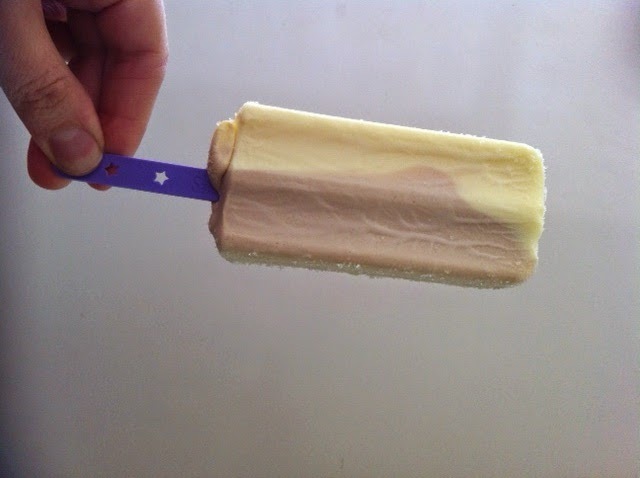 When the sugar just turns dark brown, remove it from the heat. (Don't take the sugar off too early as you won't get a nice caramel coloured cake, but don't leave the sugar for too long or it will taste bitter in the cake.) Carefully and slowly, add the hot water to the sugar (be careful and stand back, it spits! ), and stir the mixture until well combined. Allow this syrup to cool. Sift the flour, salt and baking powder into a bowl and set aside. Beat the softened butter in a stand mixer until soft. Add the remaining sugar to the butter, beating until light and fluffy. Add the eggs to the sugar mixture, one at a time, and beat well before adding the next. Beat in the vanilla and the syrup. In a stand mixer on low speed or using a spoon, add the flour and milk alternately to the butter mixture, starting and ending with flour, with three tranches of flour and two tranches of sugar. Mix in each tranche until just combined. Pour the batter into the prepared cake tins and bake the cake in your preheated oven for 30 minutes or until cooked through. Leave the cakes to cool in the tins for 5 minutes before turning them out onto wire cake racks to cool completely. Preheat your oven to 190 degrees Celsius, and line a baking tray with baking paper. Beat the softened butter and sugar together in a stand mixer until light and fluffy, then beat in the egg yolk. Using a spoon, fold both flours and the salt into the butter mixture. Add iced water to the dough and knead in if necessary to make firm dough. (I did add some water.) Form the dough into a flat disc, wrap it in cling film, and allow it to chill in the fridge for 30 minutes. Roll the chilled dough out on a floured surface or between two pieces of baking paper until 1/4" thick. Using a paper or plastic template as a guide, cut out the Beatle heads from the dough with a small sharp knife. (Cut out 12 head shapes.) Put the biscuits on to the lined biscuit tray and chill in the fridge for 30 minutes. Remove the chilled biscuits from the fridge and bake in the preheated oven 8-10 minutes or until pale golden colour. Allow to cool on the tray for 5 minutes before transferring the biscuits to a wire rack to cool completely. Cut out hair and eyes from the licorice straps, and mouths from the glace cherries, then stick these and the nut "noses" onto the biscuits with a small amount of chocolate icing (see below). I used this icing recipe rather than Margaret's. Work with it as quickly as you can, as while it is malleable to start with, it firms up quickly. Use a hot knife to help spread the icing if necessary. Chocolate icing for piping and sticking on Beatles' "faces"
Beat together the butter, icing sugar and cocoa in a stand mixer. Add sufficient milk to make the icing a smooth piping texture. Place one half of the cooled cake on a cake board or cake plate. Spread one third of the caramel icing on top of the cake, going right to the edges. Place the second cake on top of the first, then spread the remaining caramel icing over the top and sides of both cakes. Pipe music notes around the sides of the cake (and Beatles lyrics if you like) with the chocolate icing. Place the Beatles biscuits on top of the cake, securing with a little chocolate icing if necessary. 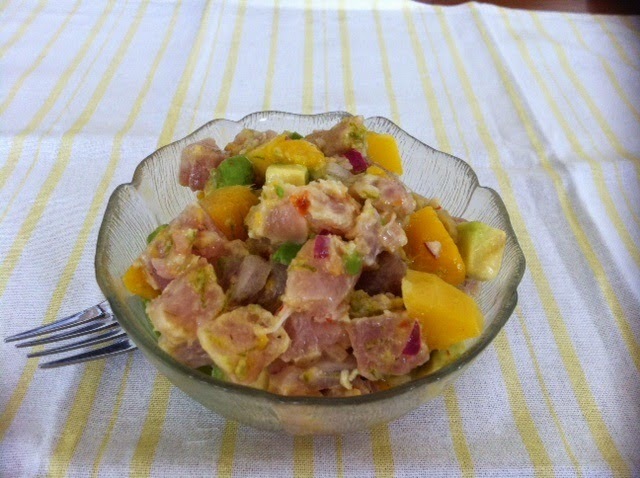 For French Friday with Dorie this week, things are a little fishy - our menu item was tuna and mango ceviche. Dorie did provide an option whereby you could sear the tuna instead (and hence no longer having ceviche), however, I decided to go the purist route and give the original recipe a go. This dish is pretty easy to make - diced raw tuna, diced mango, diced avocado, lime segments, chilli and red onion with a lime vinaigrette to "cook" the tuna - and a splash of rum and Tabasco sauce. While I wouldn't say I loved this dish, I didn't mind it either - it was OK. However, I can't see myself making it again. I bought a tiny, expensive bottle of Tabasco sauce for this dish, which I will use again - I like it on the hot side. To see whether the other Doristas made the ceviche or the seared tuna version, or whether they went the optional shrimp route, check out the LYL section of the FFWD website. 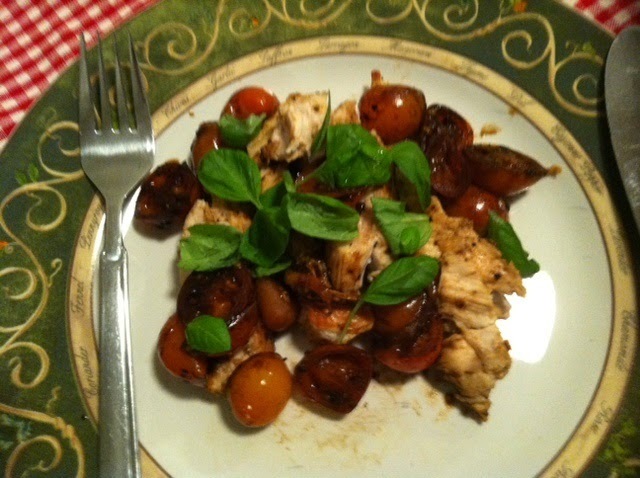 For Wednesday with Donna Hay this week, Sarah has chosen Donna's Caramelised Balsamic Tomatoes with Chicken. I don't know why the recipe title leaves out the chicken, as it is an integral part of the recipe. This dish was quite tasty. I served the chicken and caramelised balsamic tomatoes with stir fried vegetables, and it made a hearty complete meal. to play an online game. Highly recommended deliciousness! To see what Sarah, Margaret and Chaya thought of this week's dish, visit their websites. Recently, Frank Camorra of Movida fame published a recipe in The Age for an Apple, Rye and Ginger Teacake. It looked really good, with an apple layer in the middle of the cake as well as on top. However, I didn't have any rye flour. Fate played into my hands when my colleague Swee and I went to a health food store, which lo and behold, sold rye flour (rather pricey at $7.50 for a 1kg bag, compared with 75 cents for a bag of plain flour at the supermarket). When making a cake at home I look for one thing: ease. Nothing puts me off more than fiddly, time-consuming recipes. This cake was moist from the apple and all round delicious. It's a definite keeper. Flavours were passionfruit, lemon, red velvet, white chocolate and strawberry, white chocolate and raspberry and salted caramel. I shared them with my friends and colleagues, but these tasty little cakes were a steal at $2.50 each. The lemon one (bright green) had a heart on top, but I later found it underneath the strawberry one (butterfly) - probably just as well, as I gave the lemon cake to my boss. Last weekend was my Mum's birthday, and I made the trek to Toowoomba to see her. When I asked Mum where she wanted to go for dinner, she chose Angelo's House. As its name suggests, Angelo's is situated in a large old weatherboard house, with tongue and groove internal panelling. There is a lounge by the bar where you can have a quiet drink while waiting to go to your table, and a fireplace that looks like it would be warm and inviting on a cold winters day. The food has a strong Italian bent. We decided to go for a main course and a dessert each. We started with the garlic bread ($9) - basically a toasted baguette spread with garlic butter, and nothing to get excited about. Mum enjoyed this pick, and I have to say that it looked delicious. It was a very generous serving, and was rich and flavoursome. I thought I might not get through it, but it was so good, I had no worries polishing it off. He enjoyed this dish, and as he is a very fussy eater, Angelo's created a winner in my eyes. This was a gorgeous cake - it was beautifully moist from the lemon syrup, and the tangy yoghurt accompaniment complimented the flavours nicely. Mum was not overly keen on the gelato, but found the crumble to be beautiful, and she was especially impressed by the macadamia nuts in the crumble topping. The front of house service was excellent. Our waiter did the job but did not match the excellence of front of house, but we did get a lovely, friendly waitress for the dessert course. We all enjoyed Angelo's House, and there will definitely be a repeat visit. It had been ages since I made a lemon meringue pie. I love the fluffy meringue top and tart, toothsome filling, but with so many other things to make, I had overlooked this old-fashioned favourite for a while. When my colleague, Collette, asked me did I make lemon meringue pie, I decided to prove that I do by making one. Grate the zest from the lemons into a heatproof bowl, then add the juice and cornflour and stir to make a smooth paste. Add the boiling water and mix to combine, then empty into a saucepan and cook, stirring constantly until it boils and thickens, then reduce the heat and simmer for a minute. Remove the pan from the heat and add the yolks, then mix in the butter and sugar. (I then put the mixture in the pan back on the stove and heated it until it thickened a little more because it seemed quite runny and I was worried it wouldn't set.) Pour the lemon filling into the baked pastry shell. Whisk the egg whites until soft peaks form, then add the sugar and whisk until it forms a glossy smooth meringue. Spoon the meringue on top of the filling, spreading it right to the edges and completely covering the filling. Bake the pie in the oven for 20 minutes until the meringue is golden brown. Allow the pie to cool before serving. While the recipe says to serve the pie at room temperature, I liked it best chilled. In the words of Mary, we are the Ladies of the Lentils Brigade this week, as our FFWD recipe is French Lentils. I wasn't prepared to spring the $6 for lentils du Puy, and I already had some ordinary green lentils, so that is what I used. I used chicken stock to cook everything up, and I decided to keep the veges and chop them up rather than discard them to make a more complete dish. And the verdict? 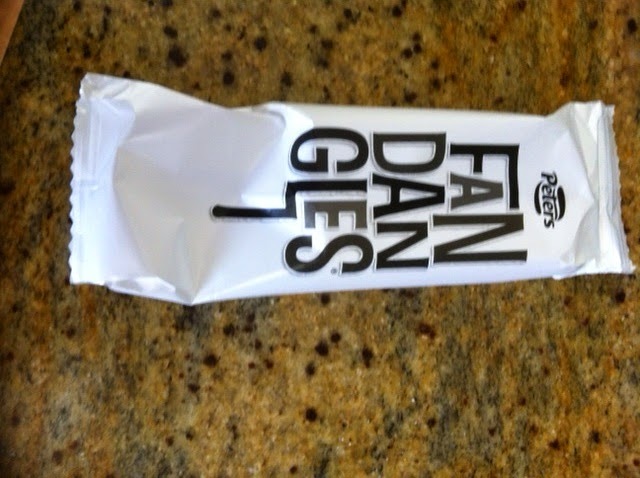 These were pretty good. I would definitely make them again. To see what the other Ladies of the Lentils thought, visit the LYL section of the FFWD website. On a recent lunchtime walk, I discovered Du Nord, a Scandinavian restaurant, and had a hankering to go there ever since. My boss introduced me to Scandi food at Dansk, and I was keen to see how Du Nord compared. The decor varies between the bar, which is all dark and mysterious, and the restaurant, which is all light coloured timber. It's less Ikea and more Scandinavian forest than Dansk. We decide to start with the Frites ($8) - after all, who can resist a good bowl of chips? This one is huge - it took us aback (in a good way) with its size. The chips come with garlic aioli on the side. These were very good chips - I recommend these on their own with a pint of Scandi beer. The potatoes were a mystery - inside, they were just like ordinary boiled potatoes, but I couldn't work out what the white coating was on the outside. Delicious though! The duck was prettily decorated with edible flowers. It seemed to be on a bed of mashed potato with foraged leaves and a very pretty sauce of what I think was tomato. (Online, it says it comes comes with winter cabbage and crisp bread branches - I don't think that was the case here.) It was quite good, but I am not sure it was worth the price tag, as the piece of fish was quite small and there was not much else on the plate. there really wasn't any room left for more food. Don't you love the edible flowers decorating the veges? You can book online at Du Nord, which is a bonus. It makes booking a cinch, and if you have to change or cancel your booking for any reason, you can do so easily. I recommend booking, as Du Nord gets very busy, and our walk-in attempt a couple of weeks before failed. The service at Du Nord was prompt and friendly, and the food was good. However, on a return visit, I'd skip the mains and stick with the sides and starters, which are better value for money. This week, Chaya has chosen Donna's Cauliflower Mac and Cheese for our Wednesday with Donna Hay group. The recipe is online here. This recipe is pretty simple to make, and s quite tasty, although next time I would leave out the garlic in the crust. I used all milk and no cream, and used only one variety of cheese, but I don't think it harmed the end result. 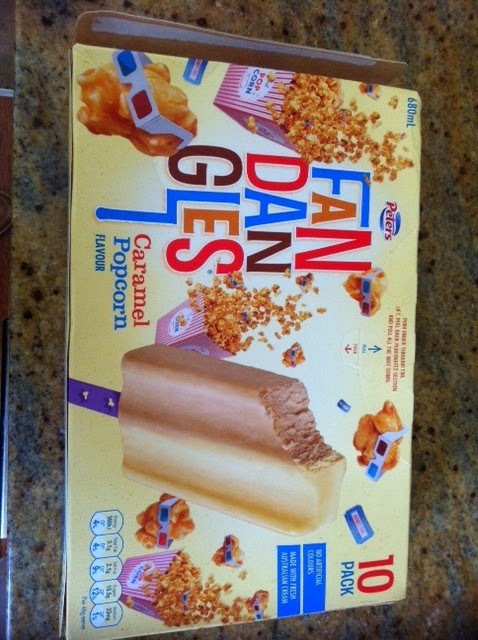 Sure, it may not have been as indulgent as the original, but it was still good. 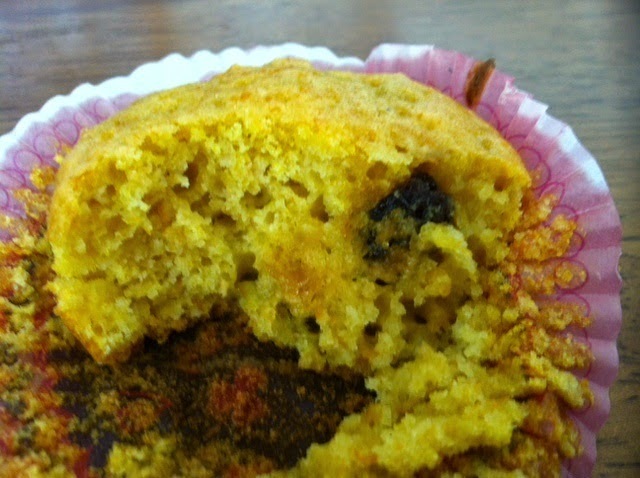 To see what Chaya, Sarah and Margaret thought of this recipe, check out their blogs. Last week, I asked Justine what kind of cake she would like, and she nominated carrot cake. Super! I hadn't made carrot cake for a while, so was glad to oblige. I don't like repeating recipes I have already made, so I headed to my cookbooks for a new carrot cake recipe. I came up with a carrot cake from Donna Hay's Modern Classic 2. Donna rarely lets me down, so that is what I went with. The end result was a moist, delicious carrot cake, that was good to the last crumb. The cream cheese frosting recipe was a bit so so, as I found that I needed way more icing sugar than Donna quotes to get the icing thick enough to stay on the cake. However, if you ignore that, it really is a super cake, and well worth making. Preheat your oven to 180°C and grease and line a 9" round cake tin. Place the sugar and oil in the bowl of an electric mixer and beat for 2-3 minutes, then add the eggs and beat well. Sift the flour, baking powder, bicarbonate of soda, cinnamon and ginger over the sugar mixture and beat until just combined. Add the carrots, nuts and sultanas and mix until just combined. Pour the mixture into the prepared cake tin and bake for 55-60 minutes or until cooked through. Allow the cake to cool completely before spreading with cream cheese frosting.